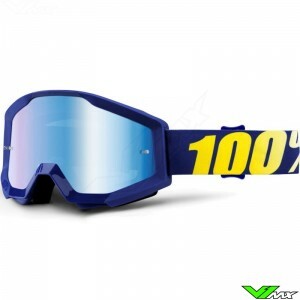 100% makes premium motocross goggles, which are specially designed for the most demanding motocross and enduro riders. 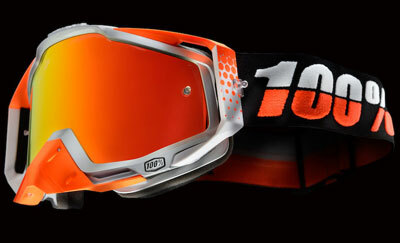 These goggles are the result of several years of design, development and testing with the best riders in the world. 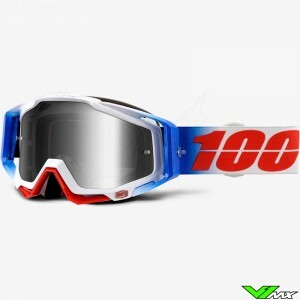 The 100% motocross goggle collection consists of 3 models. An awesome feature of these 3 models is that they are all constructed with the same frame. This means that lenses and other accessories can be used on all the different models. The technical features of the different models are explained below. The top model is the 100% Racecraft. 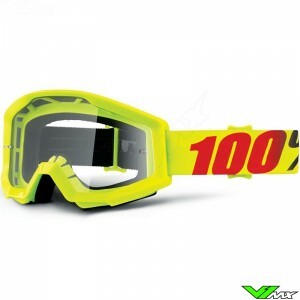 This motocross goggle has outriggers which help it fit to any size and shape motocross helmet. The 3-layer face foam provides extra comfort to the rider. The first layer is designed to drain sweat. The other two layers work together to adapt to the rider’s face. 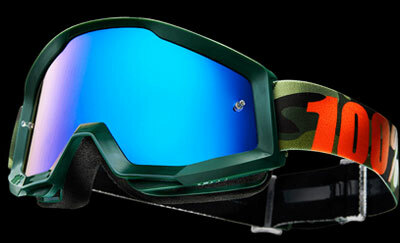 The goggles with mirror lenses come with a free clear lens, 20 tear-offs and a storage bag. The second model is the 100% Accuri. This model has a strap which is directly attached to the frame, which results in a smaller profile. The strap is 45mm high, this in combination with a wide silicone layer prevents any movement of the goggles while riding. The Accuri is also available with pre-installed roll-off system so you are immediately ready to compete in muddy conditions. 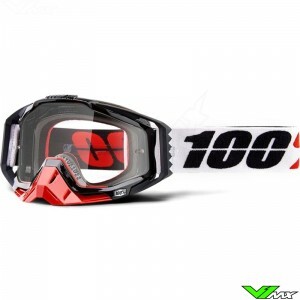 Check out all the available versions of this 100% motocross goggle on the 100% Accuri page. The third model is the 100% Strata. 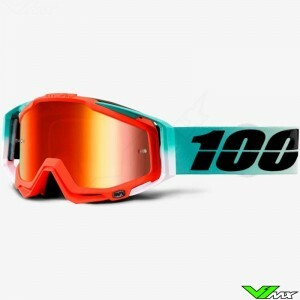 With the Strata, 100% has proven that good goggles do not have to be expensive. 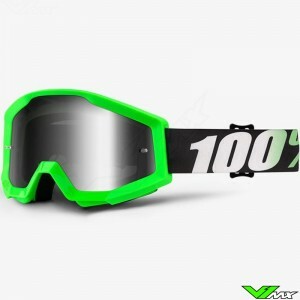 This cheap motocross goggle is perfect for entry-level motocross riders. It contains all the features needed to start riding, such as a strong anti-fog lens, silicone strap and built-in ventilation. It also features 2 layers of soft facial foam for a comfortable fit on your face. 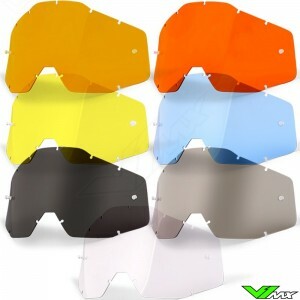 Looking for motocross goggles for children? 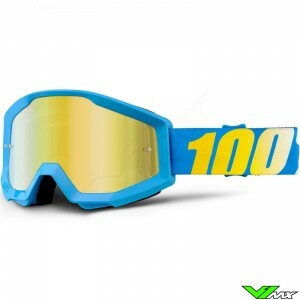 V1mx also has the 100% kids motocross goggles available in the youth section of the webshop. The American company is known for having one of the largest group of riders. 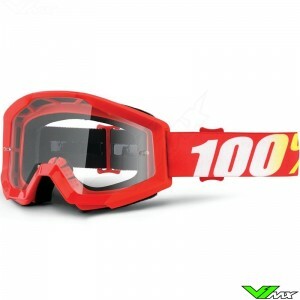 Riders like Gautier Paulin, Marvin Musquin, Cooper Webb and Glenn Coldenhoff use 100% goggles to fight for the win. Over the years the collaboration with these athletes has helped improve the goggles in terms of comfort, field of vision and usability. It all started in 1980, almost immediately after the company started the popular logo was worn by some of the best motocross riders. Over the years 100% has contributed to numerous championships and other iconic moments in the sport. Thirty years later, the passion for off-road motorsport is still as big and the brand inspires a new generation of motocross riders and ask them the original tag line, “How much effort do you give?”. 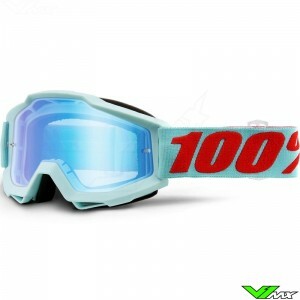 Various accessories are available for the 100% goggles. 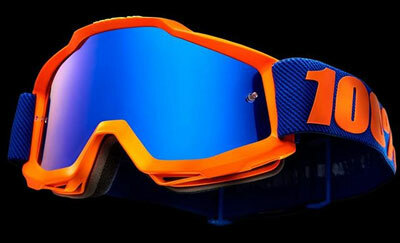 Many of the accessories fit on all goggles because the frame is the same. 100% is known for having a huge selection of lenses. There are 4 types of lenses available: standard lenses, mirror lenses, dual lenses and injected lenses. The standard 100% lenses are mainly used in low light situations, because they allow a lot of light to travel through. The 100% mirror lenses are ideal for sunny days because they block more light. Finally, there are dual lenses, these are primarily used by enduro riders to provide additional protection against objects like branches and stones. Recently new 100% lenses were introduced which are injected and pre-bent. The advantage of the 100% injected lens is less visual distortion. In addition, the injected lenses are very strong to provide additional protection. 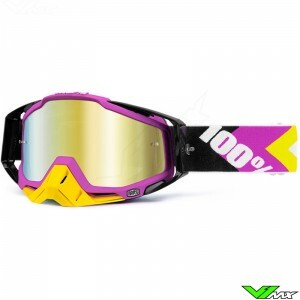 To remove sand and mud from your goggles you can choose between roll-offs and tear-offs. A tear-off is a film in the shape of lens. The film can be placed on the lens, once there is a build-up of dirt you can pull the pull the film off. 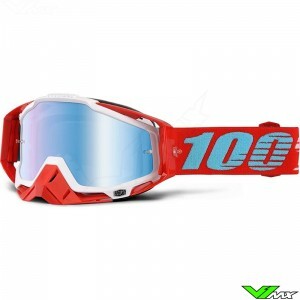 With a roll-off you have a roll off film on the side of the 100% motocross goggles, by pulling a cord you can slide the foil to get unobstructed visibility again. 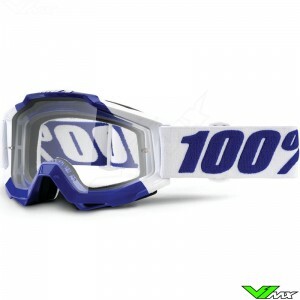 100% tear-offs and 100% roll-offs are usually available from stock! 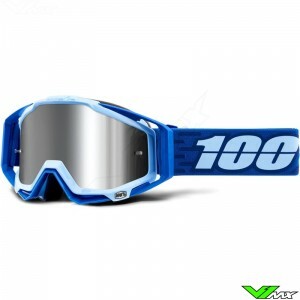 You can buy these accessories separately, but you can also choose to buy motocross goggles with roll-off already installed. This way you are instantly ready to drive in muddy conditions. 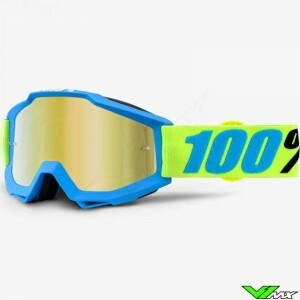 Do you want to buy 100% motocross goggles but have any questions? Feel free to contact us, we will be happy to assist you choose the right product. Due to our large range of products we always have motocross gear available that meets your requirements.